When I crave Chinese food, this is the flavor I want, spicy, sour, sweet and savory. I believe that's why this dish is so popular, as it gives you most of the essential tastes combined into one dish. This dish combines the smoky flavor of dark soy sauce, the freshness of green onion and the crunch of peanuts. I have made this dish many times, but as I often do, I have kept modifying it, and I really do feel I have developed a stunning recipe. After cutting the tofu, mix in the hot bean paste and set aside. 1 Tbsp of Shaohsing Rice Wine, dry Sherry is a suitable substitute. Prepare the sauce mixture just before beginning to cook and set it aside. Begin by preheating the wok or pan to a high heat, then add the oil. When very hot, carefully add the garlic, ginger and dried red chillies, and quickly sauté, but do not brown. Add the red pepper and green onion and cook until the mixture is almost done. 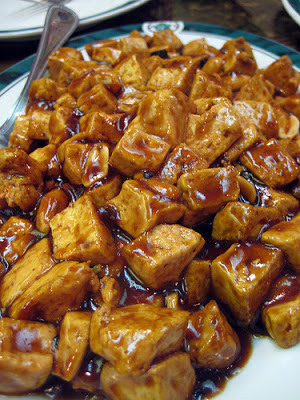 Add the tofu and just sauté until warmed through, maybe 1-2 minutes, then add sauce mixture and cook until thickened. At the very end, stir in the peanuts and serve immediately with Chinese rice or brown rice.